That's all from Holyrood Live on Thursday 4 April 2019. MSPs backed the general principles of the Transport Scotland Bill. MSPs inevitably asked about Brexit and also somewhat inevitably ScotRail during FMQs, while subject choice at schools was also raised. Earlier this morning a woman told the Scottish Parliament she felt "turned away and abandoned" after being refused help eight times in the week before her partner took his own life. Karen McKeown, from Bellshill, North Lanarkshire, took her fight for a review of mental health services the Public Petitions Committee, with a powerfully emotional appeal. Ms McKeown's partner Luke Henderson died in December 2017. An afternoon of transport awaits as ministers face portfolio questions, before MSPs debate the Transport (Scotland) Bill at stage 1. 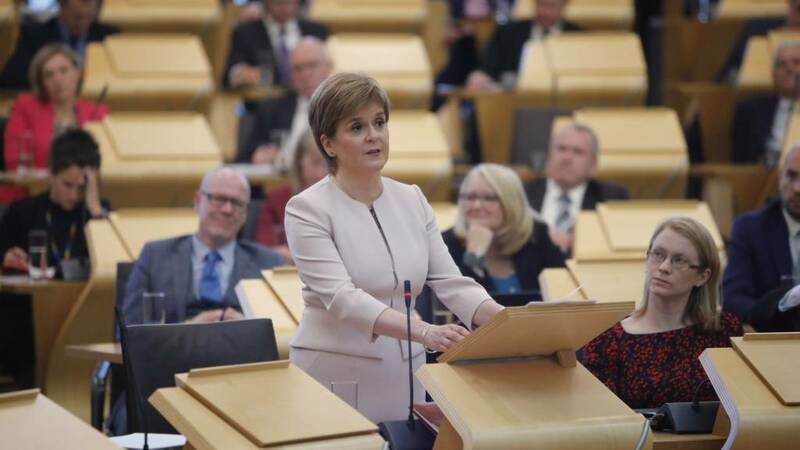 MSPs unanimously back the general principles of the Transport (Scotland) Bill. Presiding Officer Ken Macintosh reminds MSPs he will be in touch with them next week about a no-deal Brexit recall. And with that it is recess..... or is it? Holyrood Live will return next week if MSPs do - otherwise we'll see you on Tuesday 23 April 2019. SNP MSP Sandra White says there has been very intensive work done on a responsible transport bill that is now being incorporated in the Transport Bill. Ms White adds blocking kerbs being adopted in the Transport Bill is fantastic. The SNP MSP says: "People have to come first before cars. "Pavements are for people, we have roads for cars." Ms White originally proposed legislation making it illegal for vehicles to double park, which gained unanimous support before the 2016 elections. The Scottish government has defended plans that could see motorists taxed for parking at work amid claims that it will "fleece" workers for hundreds of pounds a year. Proposals for a workplace parking levy were included in this year's budget agreement between the SNP and Greens. Deputy First Minister John Swinney told MSPs that it would be up to individual councils whether to introduce it. The Conservatives said the tax would hit low-paid workers the hardest. Beginning with low emission zones, Lib Dem MSP Mike Rumbles says before introducing them sufficient public transport options must be in place. While the government agrees with this, it essentially says to local authorities "over to you" on doing it, he suggests. The government has not been ambitious with this bill on bus services the Lib Dem says and he adds he can't see any local authorities taking up what is offered. Mr Rumbles welcomes a ban on pavement parking but expresses concerns about exemptions, suggesting it provides a "get out clause" for unloading. It will make the ban "hopeless ineffective", he argues. Wrapping up the Lib Dem MSP criticises the workplace parking levy and worries the amendment, which has not yet been seen, will be voted through regardless of any evidence against it due to the balance of parties on the committee. John Finnie says the Scottish Greens will back the principles of the Transport Bill at decision time. He does say there is no sense of crusading from the Scottish government, arguing it is too conservative. The Green MSP says the market stall prevails in terms of bus transport, it will be private profit with councils only able to pick up the scraps. He praises Lothian Buses which is run by the council to the benefit of the people of Edinburgh. Mr Finnie concludes saying the bill lacks ambition and must be amended. Green MSP John Finnie highlights Labour supported a parking levy in its manifestos for Glasgow and Edinburgh council elections. Mr Smyth says his concern is that people living in areas outside of Edinburgh but who work in Edinburgh will have to pay the tax. They won't have a say on whether it is introduced nor will any of the revenue be spent on public transport outside of the city, he explains. It is an attack on the take home pay of workers, Mr Smyth argues. It will allow higher earners to "pay to pollute," he says. Labour MSP Colin Smyth says councils should be able to properly regulate transport with an integrated system for tickets. You can imagine these things but this "timid" bill will deliver none of them, adds the Labour MSP. He criticises the legislation in terms of LEZs, parking on pavement exemptions and bus services. The Labour MSP points out there has been a larger fall in bus patronage than in the rest of the UK. He argues the cuts to council budgets are behind this, as they have led to cuts to bus services. This bill does not end Margaret Thatcher's ban on councils running bus services, he argues. I don't think the top down method this bill is taking is the right way to go, Mr Greene states. Local authorities know their communities and their streets best, and they should be empowered he states. The Tory MSP insists the workplace parking levy should have been brought to the rural economy committee in stage 1 to allow it to scrutinise it. He says his party "will oppose it at every stage of the proceedings", labeling it a regressive tax on the workforce. "I think there is a role for local bus franchising," says Mr Greene. He regrets the bill only allows this where there is an unmet need. The Tory MSP argues there are so many unanswered questions, with the main one being: does the bill go far enough? He says the lack of an interconnected ticketing system shows the government has missed a trick. Tory MSP Jamie Greene says that in many areas, the bill does not go far enough and instead "tinkers" with existing legislation. There is little which proposes a dramatic improvement of buses, railways, ferries or roads he argues. Turning to low emission zones, he says businesses are concerned about operating in the zones and we should listen to them. Mr Greene points to the high cost of an electric taxi as an example. We'd like to see a clear timetable for introduction of LEZs and phased transitions, he says. The Tory MSP also expresses concern that it will lead to disabled people have to pay to get into cities because their only option is to drive. Mr Mountain says on smart ticketing, the committee felt the government lack ambition to introduce an integrated transport system. This would require a single ticketing system across all forms of transport, which the government has robustly resisted, he explains. The Tory MSP doubts any tangible progress will be made. He pivots to pavement parking, calling on the government to bring an amendment at stage 2 to remove exemptions presenting impracticable. Further parking prohibitions could increase accessibility to urban areas, he says. In conclusion he says the committee back the general principles of the bill, with the caveat it needs improving.